Are you looking for a desert for your little one’s birthday and would prefer not to load him/her with a bolus of sugar, wheat, and dairy? Here is a delicious vegan, raw chocolate mousse made from avocados! yep, thats right, I said avocado, but no one will be able to tell! it’s deceptively delicious! 4. Layer with fresh berries. Chop nuts into a fine meal. Add dates and maple or honey and chop until well mixed. Add cinnamon and a pinch of salt. The texture should be crumbly and sticky. Press evenly into a pie plate. Sliced strawberries or bananas can be layered into bottom of the piecrust. Spread the Chocolate of the Gods Mousse evenly into the pie crust and generously top with fresh berries. 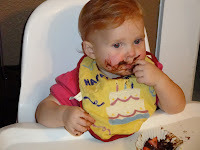 Cece devouring the chocolate mousse on her first birthday.